On 10 April Blogger has changed its blogger template style.So,now in editing HTML template becomes much easier for web developers. 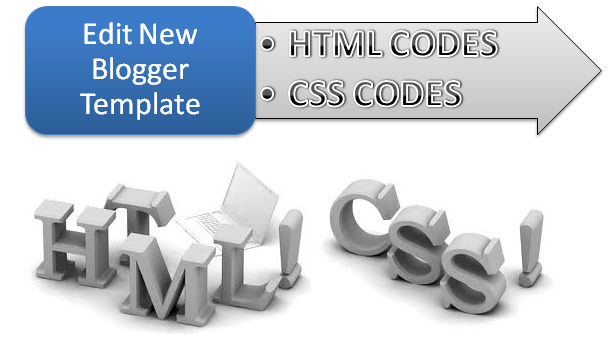 I am going to explain you how you can edit your New blogger template with CSS and HTML codes. But now in new template you can edit your CSS code customization by below way. Now first we find the <b:skin> with using search box(CTRL+F). Then click on the symbol to expand the widget. But in new Blogger Template HTML codes customization is different from previous. Follow some steps to edit HTML codes. Now click o symbol to expand widget. Then search 'post' ' var='post' code using search box (CTRL+F). If you are facing any problem or wanted to give any suggestion then don't forget to comment. About the author: Shujat Hussain is an emerging blogger and tried to learn more about blogging and programming language.professionally he is a Mechanical Engineering Student From Uet Lahore. Join him On Facebook. Hi Aktar, This is very helpful article to edit CSS. Thanks dude. I was browsing for an article with info on how to edit CSS. Thanks for providing this informative article. Thanks for such an informative article Aktar. It is very helpful to edit CSS codes. Simple and clear post on how to edit CSS codes. thanks Aktar.